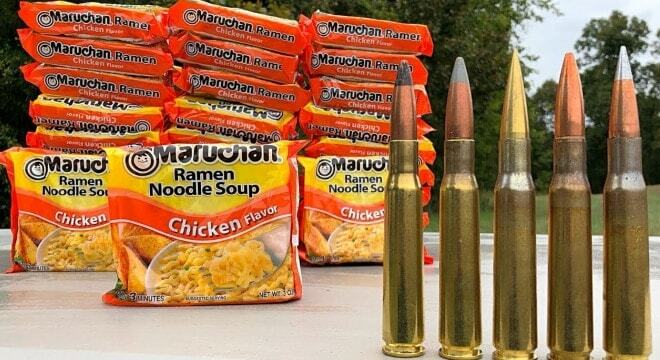 While the popular Japanese instant noodles are cheap and easy, their ability to withstand .50 BMG fire has been little documented until this week. Voted Japan’s best invention a while back — even beating out the films of director Akira Kurosawa — ramen is one of the cheapest “foods” you can buy. To see how many packs of the salty dried noodles it takes to stop a fiddy, Kentucky Ballistics does the research above — but don’t worry about wastage as they donated an equal amount riddled in the test to a local food bank. There was even some left over to test some pistols against the same crunchy wall.